Loneliness and isolation among seniors in the U.S. is considered an epidemic. Social isolation can change a person’s genome in potentially harmful ways, comparable to what obesity or smoking does to you—increasing risks of heart attacks, cancer, Alzheimer’s, and more. But how do you pull solitary seniors, who may be physically unable to leave their homes, from isolation? Some companies think technology is the answer. There are virtual reality experiences designed for older adults and anyone else with limited mobility. And then there are robot pets, designed to socialize with older people, including a seal, a dog, and a cat. In the future, though, the home robot friend designed for seniors may look more like a tabletop art piece, according to fuseproject’s Yves Béhar, the designer behind products like the Jawbone UP and the SodaStream Source. Fuseproject created an artificial intelligence console, ElliQ, designed to keep older people engaged and connected to friends and families, as part of a partnership for a technology company called Intuition Robotics. 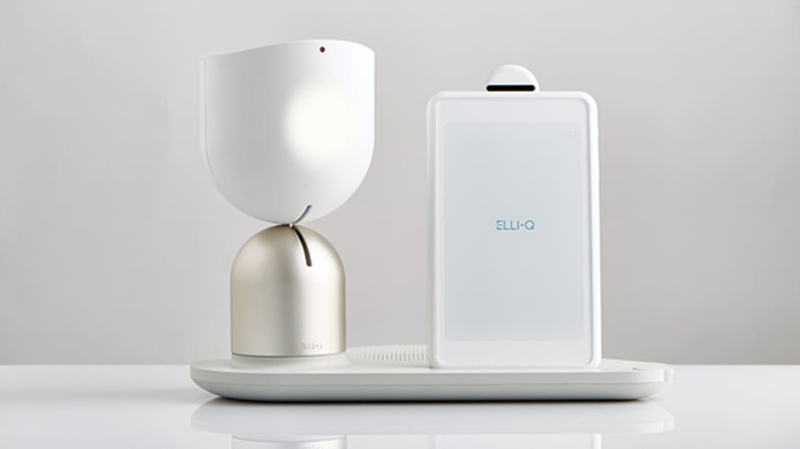 ElliQ suggests TED Talks and audiobooks, plays games, reminds people of their appointments and medications, arranges rides, and can even tell you that you should go for a walk if you’ve watched a lot of television that day. It’s meant to be an easy way for older people to communicate with their families via Facebook, Skype, and similar technologies. Its screen can pull up videos and photos, and remote family members can even access data about their loved ones' environments (including the indoor temperature). As time goes on, ElliQ learns preferences and can pull up recommendations based on prior requests or input from other family members. It's kind of like Amazon's home helper robot Alexa, but created for people who spend a lot of time alone, but still don't quite understand how their Facebook timeline works. The robot is on display as part of NEW OLD, an exhibit at the Design Museum in London, running until February 19. In February, Intuition Robots will begin a trial of the technology among people in the San Francisco area. All images courtesy fuseproject and Intuition Robotics.